Wednesday June 10 1908 Will helped me with the washing this morning. I got the dinner over and went to town at 2.12. I had a good visit with Ott. I found him alone in the office. Mother has decided to give me the money for my lot and keep it herself. That suits me better than selling it to Dr Prentiss. I came home at 5.39 to do the evening work. I rode over to Aunt Libs with Uncle Jim which made me a little late. 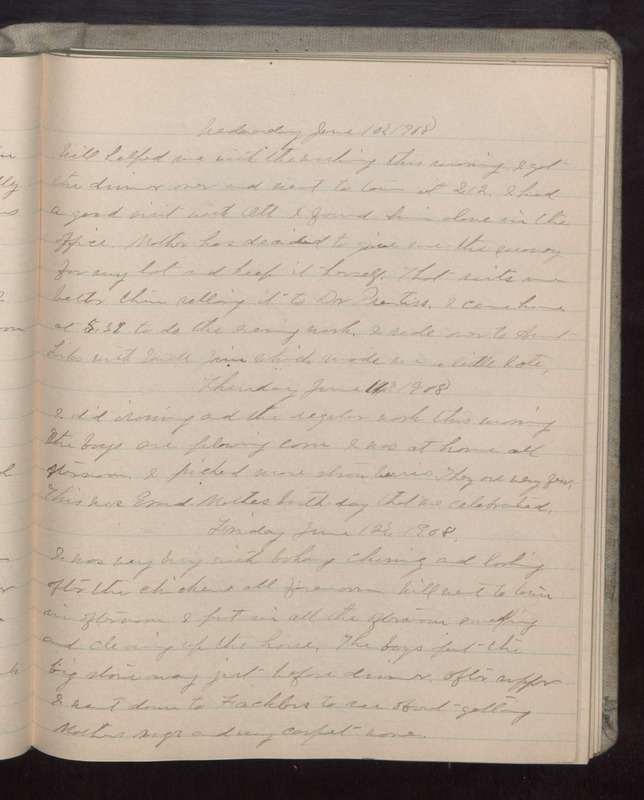 Thursday June 11 1908 I did ironing and the regular work this morning the boys are plowing corn I was at home all afternoon. I picked more strawberries. They are very few. This was Grand Mothers birth-day that we celebrated. Friday June 12 1908 I was very busy with baking churning and looking after the chickens all forenoon. Will went to town in afternoon. I put in all the afternoon sweeping and cleaning up the house. The boys put the big stove away jist before dinner. After supper I went down to [illegible] to see about getting Mothers [illegible] and my carpet [illegible].